Are you kidding me? Questioning your buying decisions is NOT a downside. It is an inner voice that makes you think twice about buying useless knick-knacks. My mother is the direct opposite. She is a pack rat. My brother and i got so frustrated that we ended up clearing out the garage that was literally filled to capacity and dumped everything inside at Goodwill. It took 2 days of constant moving and Goodwill forced us to take it to another location because we had given them too much. 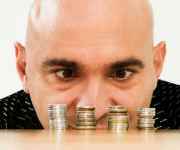 There is nothing wrong with being a frugal spender. That is why dollar stores exist. Everyone has too much already. How many countless garage sales have you been to and wonder why people have so much junk. It can be dangerous at times especially if you have a young child to take care of which needs more than an adult to grow up healthy in mind and spirit. Being frugal is, in the end, a good thing. It teaches responsibility. You get what you need and that is all. Most people can’t handle the temptation of MSM advertisements.